Here’s the state profile for Vermont. To review the entire profile, open the PDF that is attached to this post. Thank you for the excellent work creating the state profiles. It is really impressive. I'm wondering if there is an opportunity to add material? The Vermont profile is very heavily focused on the legislature and leaves out a great deal of the on-the-ground work that has been happening in Vermont prior to the 2013 conference, and to an even greater degree, since. We have the Child & Family Trauma Workgroup, a public-private group that has been meeting for 15 years and was the group that supported the 2013 conference, and then the 2016 Building Flourishing Communities Summit that introduced the ACE Interface program. The CFTWG group includes representatives from every human services department, the Agency of Education, and a broad range of community partners. We meet monthly, and have long worked to infuse trauma-informed principles through-out the agency and to support community partners in their work to become trauma informed. The CFTWG steering committee recently re-wrote the Agency of Human Service's policy for a trauma-informed system of care, and we are now in the process of rolling out that policy. 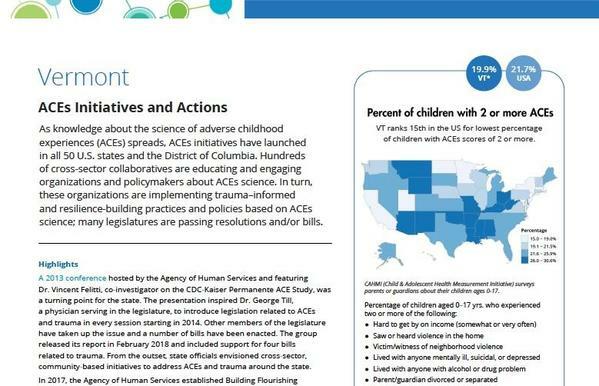 The Agency of Human Services and particularly the Department of Mental Health has been working hard to move the conversation on ACEs to a population-level public health approach, and we have seen a good deal of movement on that front over the past year. The bill that is moving in the legislature this session is a good example of that, although we continue to hope to get additional changes in that bill to benefit more Vermonters. Vermont also has a great deal going on regarding building trauma-informed school systems, and we still have ACEs groups around the state that meet monthly. The last thing I'll mention is the ACEs screening initiative going on at the Plainfield Health Center, led by PA Kim Pierce. Kim has been screening for about 8 months now, and recently spent her own money to have a video professionally produced. The video is beautiful and very well done. Kim is going to make it widely available. If you would like to follow up on this, it might be best to email me directly: kathleen.hentcy@vermont.gov or call my cell: 802-477-3008.